The North Hill Communities Local Growth Planning initiative includes the communities of: Highland Park, Mount Pleasant, Tuxedo Park, Winston Heights-Mountview, Crescent Heights, Renfrew, Rosedale, Capitol Hill and Thorncliffe Greenview (south of Mcknight Blvd). 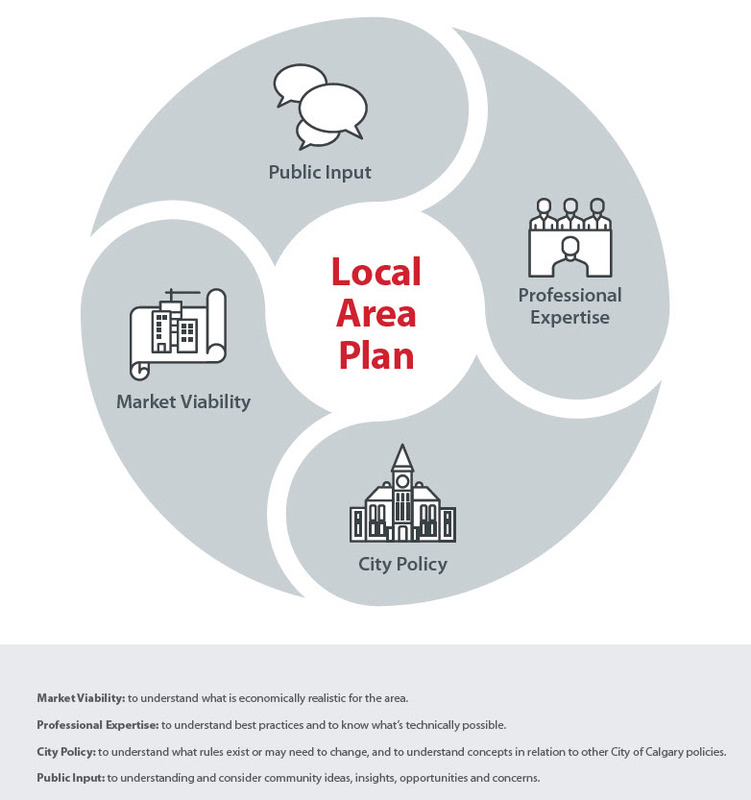 Through the local growth planning process, we’ll work together to create a future vision for how land could be used and redeveloped in the area – building on the vision, goals and policies outlined in Calgary’s Municipal Development Plan and the Developed Areas Guidebook. Communities change and evolve over the years. Buildings gain character, community demographics change, trees mature, local amenities and businesses change ownership and offerings. A big part of a community’s life cycle is redevelopment, which often begins when communities reach a certain age and homes, buildings and amenities need to be refreshed and revitalized or renewed and replaced. Looking more broadly, across the whole city, we need to consider where and how growth and development should happen. We need to consider the sustainability and our city’s urban footprint, we need to ensure existing infrastructure can be maintained and amenities and facilities in established neighbourhoods have the population needed to support them to ensure they continue to thrive. We also need to balance the need to grow and develop with the need to retain and enhance the unique character of our neighbourhoods, historical resources and the natural environment. The City is responsible for managing growth and development across Calgary and looks at how and where growth should happen. There are key areas where growth and development is encouraged and a city-wide plan for growth to be distributed between developed and new communities. What is local growth planning? Through local growth planning, we look at the fabric of a specific local area, the community’s vision for the evolution of the community, the ideal places to accommodate growth, and how to make the best use of limited land – balancing the need to increase density, improve mobility and enhance places and spaces to live, work and play. Increased growth and redevelopment is anticipated in the communities of Greenview, Highland Park, Mount Pleasant, Tuxedo Park, Winston Heights-Mountview, Crescent Heights, Renfrew, Rosedale, Capitol Hill over next few decades. Working together, we will create a local area plan(s) to help guide growth and redevelopment in a way that integrates and enhances existing community character and ensures the area is vibrant and thriving in the future. WHAT COMMUNITIES ARE INVOLVED & WHY? A new local area plan(s) will fill gaps in communities where no local plan currently exists and replace other plans that are largely outdated. Updating and consolidating policies in the above plans will provide a more comprehensive picture of where growth should occur in the future. This is particularly important for growth corridors such as Edmonton Trail NE, Centre St N, 16 Avenue N and 4 St NW that are within or adjacent to multiple communities. The City is preparing to invest in upgrades to the streets and sidewalks of Edmonton Trail NE and Centre St N to provide more options for safe travel by pedestrians and cyclists while still accommodating vehicle traffic. Further, identifying local growth opportunities along these corridors and within communities is important in order to support existing schools facing declining enrollment, retain and expand the variety of commercial and retail services and support recent and future investment in transit infrastructure, including the Green Line and North Crosstown BRT (Bus Rapid Transit) services. For those wanting to do further reading, here are some helpful background documents on the project, City planning processes and/or growth and redevelopment. As the project progresses, this library will be added to. Get involved today by learning more about why developed communities need to evolve, how growth and redevelopment is managed and why local area plans are important – DISCOVER and learn more now. Phase two engagement is launching February 12 - March 10, 2019. Click the ENVISION button below for more info. Why do developed communities need to evolve? How is growth and redevelopment managed? Have a question? Ask the project team. Share and discuss what you love about your community with your neighbours. What does it tell us about the area? Discussion was open October 16 - November 25. We were envisioning and exploring key opportunities and big ideas and the future vision for growth! Learn more about the North Hill Community Working Group and see what they are working on. There will be multiple opportunities to get involved and provide input within each phase. Learn more about who can get involved and how public input will be used by clicking on the tabs below. Opportunities to get involved online will be linked below and details about event in the community will be shared in the "Key Dates" section on this page. Anyone who is interested in the project can get involved. This includes anyone who lives, works or visits in the area, anyone who owns property or land, anyone who is considering opening a business in the area or proposing a new building or development in the area. Having a broad range of participants and input will help ensure a variety of perspectives are considered in the development of the local area plan. How will public input be used? Your input, and the input of other citizens and stakeholders, helps City decision makers understand people’s perspectives, opinions, and concerns. Input collected in each phase of the project will be compiled and share through a What We Heard report. Decision makers will consider public input and aim to demonstrate how input has influenced decisions or if decisions were not influenced by public input, explain why. Although it would be a great outcome, the goal of public engagement is not to reach consensus or make everyone happy. Public engagement is also not about voting or collecting representative information. Public engagement is about considering the input, ideas and perspectives of people who are interested or impacted by decisions, before decisions are made. Public input is an important part of local area planning, but is one of many areas of consideration in the decision-making process. Learn more about engagement at The City, visit engage.calgary.ca/about. Join our email list to find out about upcoming participation opportunities and to stay connected to the project. In phase two, we were discussing the future vision for growth. In Phase 1B we were engaging online and at pop-up events in the community to gather ideas and values. The City hosted 4 pop-events in your community to ignite interest in the project and encourage working group applications. Learn about the project and upcoming opportunities to get involved. Learn why growth in developed communities is needed. Share what you love about your community and chat with your neighbours. Discuss the future vision for growth. Discuss key opportunities and big ideas. Identify topics that require further exploration. Key topics, options and alternatives are explored and evaluated. Review and provide feedback on draft proposed plan. The final proposed plan is created and shared. The final proposed plan is ready for Council review and decision. Landowners decide if and when they want to develop or redevelop their land. If a landowner decides they want to redevelop their land under a different land use district (zone), they must apply for a land use redesignation. In some cases, The City (rather than a specific landowner) will rezone land. The City is more likely to rezone land if it is aligned with the long-term vision for growth and redevelopment such as in the Municipal Development Plan or local area plan. City Council is the decision maker on all land use amendments. Local area plans are meant to be ‘living documents’ that may be amended and updated over time as the community changes and evolves and as conditions and circumstances in the area change. City Council is the decision maker on all local area plan amendments.